The congregation was founded in 1870 as Ohave Sholom (Lovers of Peace) by a group of families primarily from Mariampol, Lithuania. The congregation is considered to be the oldest Orthodox congregation still existing in Chicago. Anshe Sholom Bnai Israel Congregation began its long record of service to Chicago's Jews with a fight over a hat. One hot day in the summer of 1870, Duber (Dov Ber) Ginsburg, an immigrant from Mariampol, Lithuania, appeared for services at the Bais Medrash Hagodol synagogue wearing a straw hat, but the leaders of the shul took exception to its frivolity and threw him out. Offended, Ginsburg assembled a minyan from his old-country friends, and founded a competing shul, Ohave Sholom Mariampol, at Polk and Dearborn Streets. Barely a year later, the Great Chicago Fire drove many homeless Jews into their neighborhood, and membership grew rapidly. In 1892, the congregation merged with the Anshe Kalvarier shul (whose building had been demolished when 12th Street, now Roosevelt Road, was widened) and adopted the name, "Anshe Sholom Congregation." In 1894, they retained their first Rabbi, Abraham Samuel Braude zt"l, who served until his death in 1907, and the shul took its place in the top rank of Chicago Jewry. It was long known unofficially as "the Mariampoler Shul" and also informally as "the Straw Hat Shul." In 1910, two great events occurred: the congregation brought Rabbi Saul Silber zt"l to Chicago, and moved west into a new shul building at Polk and Ashland; a magnificent domed building by Chicago architect Alexander Levy. However, the Jewish community was moving farther west into the Lawndale district, and the Ashland neighborhood soon dried up. 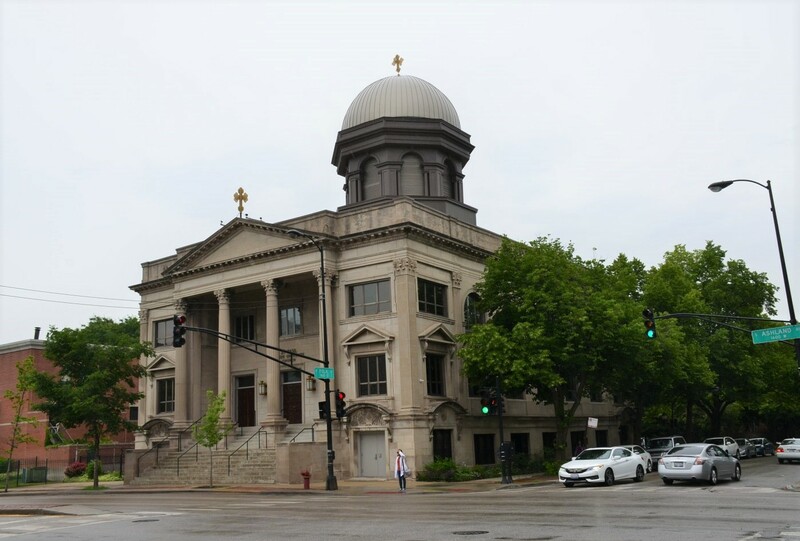 So they opened a branch on Homan Avenue and during the 1920s, sold the Ashland Avenue structure to a Greek Orthodox Christian congregation which still functions to this day. They soon built a grand new edifice at Independence and Polk. In that era, the West Side was called "Little Jerusalem," and Jewish life enjoyed a golden age of growth, vigor and prosperity. It was also at this time that Rabbi Silber helped to establish the Hebrew Theological College and served without salary as its first President, while continuing his leadership of Anshe Sholom until his death in 1946. In the late 1930s, a group of members saw the potential of bringing their kind of open, welcoming Orthodoxy to the North Side, where congregations of other kinds had been thriving since 1910. They began a branch called "Lakeview Anshe Sholom Center," and opened in 1940 in a converted greystone residence at 540 West Melrose Street. As the branch grew, the members hired a young Hebrew teacher, Rabbi Herman Davis zt"l, and quickly elevated him to the position of Rabbi of the congregation in 1945. More than anyone else, it was Rabbi Davis who made the Lakeview experiment a success, and built the shul into a respected center of Orthodox worship, communal life and education. Although Rabbi Davis began early to raise funds for the construction of a permanent synagogue building, he and the congregation decided to put education first, and instead saw to the construction of the school building which has since become the property of the Florence Heller JCC, directly east of Anshe Sholom. Only after this was finished was the present shul erected and dedicated, in 1959. Two more mergers brought the congregation to its present status. In 1960, the last few members of Congregation Bnai Israel gave up on Old Town, ceased operations in the 1300 block of Sedgwick Street, and the shul became "Lakeview Anshe Sholom Bnai Israel." Two years later, the long postwar decline of the Old West Side brought an end to the main Anshe Sholom Congregation on Independence Boulevard, and it too merged, creating the present shul's name. Anshe Sholom Synagogue was constructed in 1910 by the Jewish community and in 1927 was sold and converted into a Greek Orthodox church. It was the first Greek church to be designated a cathedral in Chicago. Ohave Sholom Mariampol is a cemetery within a cemetery. Once used to support the activity of the busy cemetery, this structure, built in 1930 and donated by the Morris family, has long been abandoned.